It's official -- I love, love, love the spin swirl! I first saw it on YouTube last year, and tried my hand at it in another challenge, but the results wren't impressive. And my first two attempts this time weren't much better. But I really like how my third try turned out. I had been planning another go after I poured this one, as the colors seemed dim, the swirls patterns murky, and the tops very unimpressive. But the colors morphed back, and when I cut it open everything was bright and well-defined. The good swirls were on the inside, as Amy showed us in her tutorial. One of the problems I'd had with previous attempts was in controlling the faux-funnel pour. So this time, I used squeeze bottles, and instead of pouring from above, I inserted the tip in and squeezed. Much better! Of course then I had to clean the bottles, but it was worth it. I poured several layers of faux funnels, evenly spaced three across my homemade all-purpose, double-height, four-bar tray mold. I then spun the tray around so much that some escaped, partly because of the extra height (so I could cut them horizontally). Next time, I might try pouring and swirling in two passes, as it's hard to get the centers to distort without the sides mixing too much and slopping out. BTW, I didn't like how flat the bars ended up in my previous batches, so I trimmed them down to make them better proportioned. So they are more like big guest-sized bars. They are still fairly detailed, though, because the squeeze bottles allowed for some super-fine lines. I won with this one, but it was really close, as there were so many beautiful entries! Another Fanta-bulous soap! The colors are as incredible as ever, and your swirls are wispy and well-defined at the same time. Simply gorgeous! 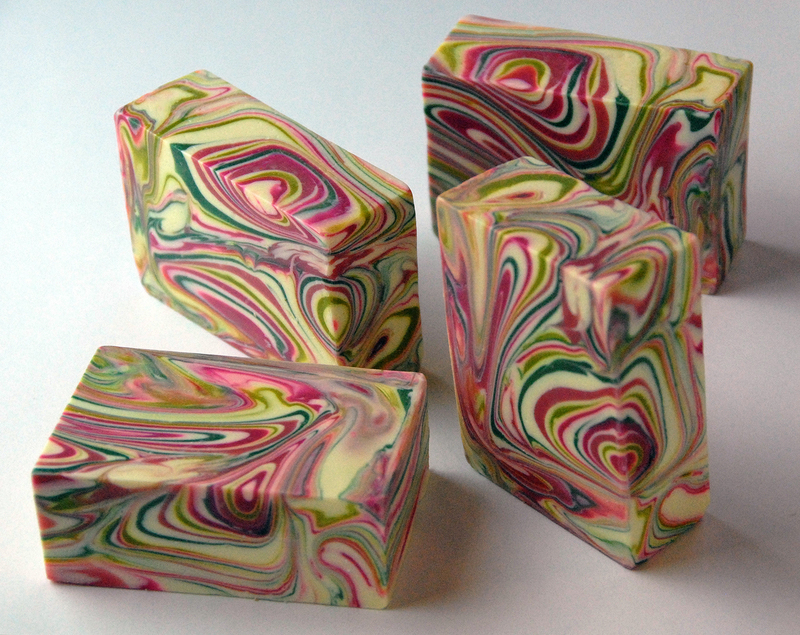 Beautiful soap, love your colors the swirls are great! Using squeeze bottles is brilliant. THAT is how you get such thin layers. I'm trying it! Your soap is absolutely beautiful, by the way. The colors are amazing! Squeeze bottles for the win!! I appreciate you sharing how you made this work! It can definitely be difficult to get the inside to spin without overmixing the outside, but these turned out fabulous! Winner winner chicken dinner, amazing dropped my mouth open. Amazing clarity,You are a great master! 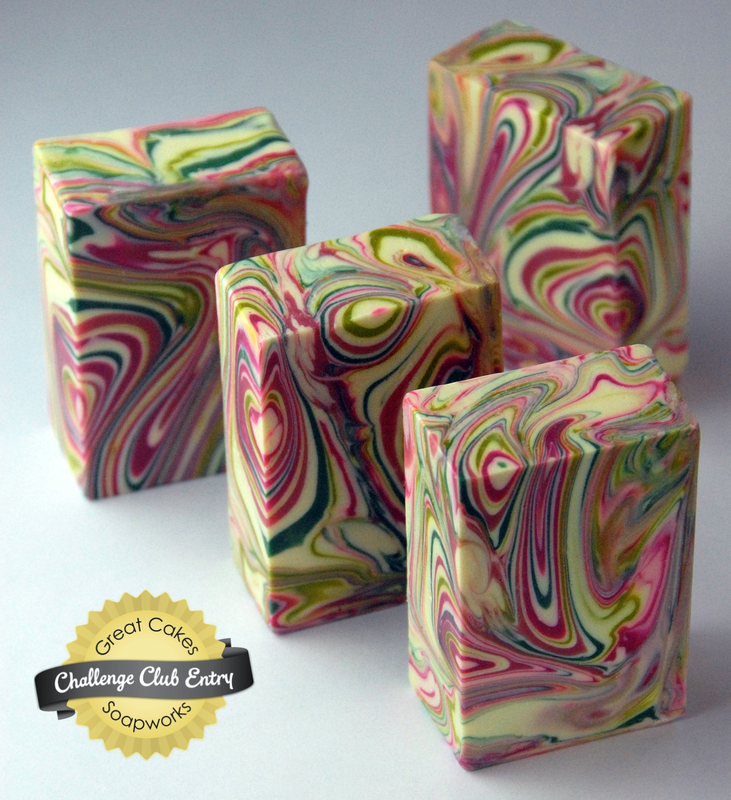 Another beautiful soap with bold colours! You are so daring,I love it! Does your daughter still helps chosing them? Your recipe looks great, I shall try it. Thanks for sharing! I'm transported to Golden Gate Park--that rose garden. The veils and ribbons of your soap float around me like the breeze. It's simply beautiful. The control squeeze bottles is evidently worth the trouble. I'm mesmerized. Thank you for sharing recipe, technique, colorant with vendors and links. You're the best. Your swirls are so crisp and and beautiful! I love the way you used squeeze bottles - what a brilliant idea! Wow! Absolutely stunning! Thank you for generously sharing your recipe and technique. That being said, a wonderful chef can share their recipe, but it definately doesn't mean someone can recreate it as its shown. Congratulations on your sweeping win! Spinner Spinner Most Awesome Soap is the Winner! 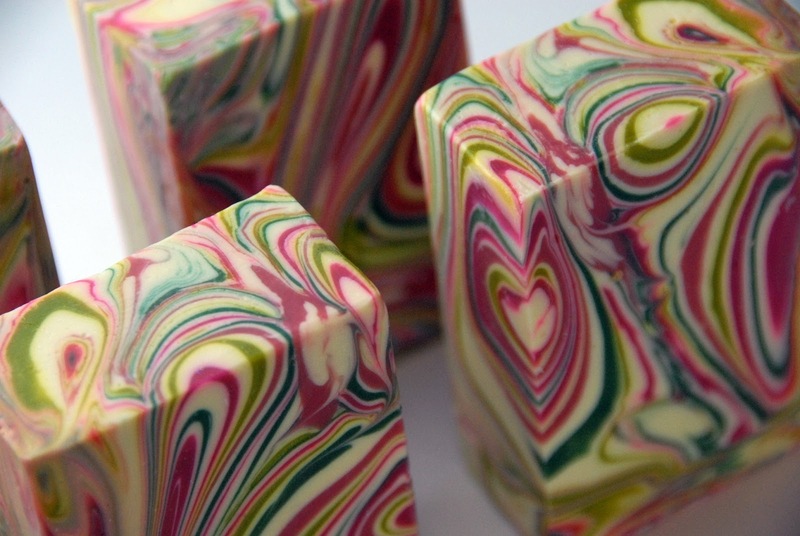 I'm thrilled to see my #1 favorite Spinning Swirl soap globally acknowledged. Bravo Claudia! And thank you again for all the recipe, clear directions +vendor links. There were so many beautiful entries; it's no wonder it was such a close race! Beautiful soap. My husband bought some of this oil, (Costco blend), and I would like to use it, but don't know how to enter into soapcalc. Any suggestions?